Just a quick little write-up about the CareerBuilder Challenge as Jack is still on the mend. The old Bob Hope remains a pro-am at heart with celebrities competing alongside the pros this week. 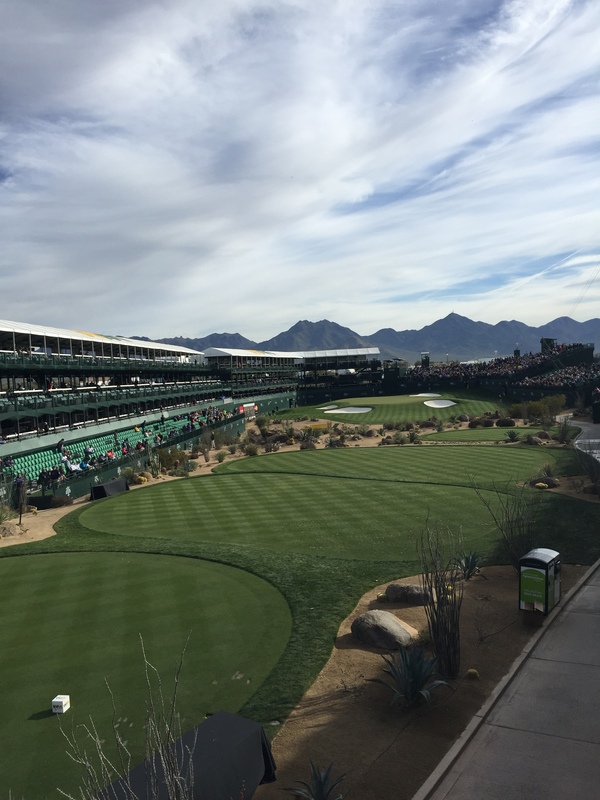 We’ll see three (3) not terribly memorable courses over the first three rounds (La Quinta, Nicklaus Something or Other, and TPC Stadium West) that showcase brown rough, green fairways and greens, mountain views, and stupid low scores. Honestly, it would not be at all surprising to see another #59watch or two, even with the “bad weather” that is supposedly in the area. Also, it’s a three-day cut, so get ready for a rare weekend Bowditch sighting and a near double-digit under par cut-line. Looking through the field and it’s… abysmal. Well, maybe not that bad, but not good by any stretch. Phil Mickelson has committed to play the event at the last minute, having played fewer than a handful of rounds since multiple back surgeries in the off season. Lefty also has duties as Tournament Host to look forward to, so his success outlook is worse than Kenny Pigman’s (a real player in the field and totally not just a made up name). In all reality, Patrick Reed is the best player in the field, and having won here in the past is a definite favorite to win this week. Other potential top finishers this week include Bill Haas, Charlie Hoffman, and David Lingmerth, who have all enjoyed past success in this event. That’s enough about the CareerBuilder Challenge, whoever wins better be ready to shoot -25 if past results are any indication. Jack’s Summary: DJ, Fowler, Euro guys, but no Rory. Much better tournament to watch. Better players. The field over in the Middle East this week has a far superior field compared to the CareerBuilder, and it’s good to see a couple top Americans making the trip to compete against the world’s best. I’m still disappointed I didn’t pick Jordan L Smith (who will be eligible for WGC events and majors this year, mark my words) with my final pick in the fantasy draft. He’ll probably take top 5 this week in Abu Dhabi. This view is priceless. Sets a good tone for the week! The 2017 fantasy golf season is upon us and the best part (the draft) has already come and gone. Beginning last year, six GOTM contributors have competed against each other in a year-long total money fantasy game with a single draft prior to the Sony Open. Each contributor selected 25 players via a snake draft. As usual, things got interesting once the upper echelon of PGA Tour players had all been selected. Also not surprising, a healthy Tiger Woods garnered early interest, but can’t believe how long it took to actually be selected. Below are the draft results for each of the six contestants as well as short recaps about how each of them feel the draft went. I (unwillingly) took the first pick in the 2017 draft and had to go with Dustin Johnson. From there my picks just kept getting better and better. All joking aside I’m very happy with my 11 rounds and then things got dicey. It seemed like we ran out of good players to draft earlier than last year. I’m banking on James Hahn, Adam Hadwin, John Curran continuing to play well and hopefully getting wins in 2017. I also took a flyer on Bud Cauley who was out on medical last year and Graham Deleat who had a terrible 2016. I think I finished the draft strong with my last 4 picks (Jonas Blixt, Andrew Loupe, Cameron Smith, Peter Malnati). 2017 will be my year! Player on my team I’m excited about is Jon Rahm. I took him arguably way too early (3rd Round) but I’m hoping he plays in a lot of events and I almost positive he will get his first win this year. Best value: I’m really banking on Graham Delaet have a turnaround from last season because last year he was absolute garbage. Doesn’t help having the yips but towards the fall he seemed to be on the mend. Getting him at the 84th pick may be a great call by me… or absolute garbage. My biggest regret is not a player that I didn’t pick but rather some that I just missed. I really wanted Ollie Schneiderjahns as I had him last year and he made me a whopping $0. Now he actually has his card and I think he’ll make some serious cash. I also missed on Danny Lee and Harold Varner III who I think will have good years and they play in like 30 events. Best pick on any team: Jon Rahm – He’s better than everyone else at golf. Worst pick on any team: Xander Schauffele – Probably a good rookie with great potential if he wasn’t a made up German children’s book protagonist. If you look up our article on what’s to watch for in 2017 golf, I said there’s a great chance H-dek would be the best, and if not, second best behind DJ. And since I selected second, and Pat took DJ with the first overall selection, pretty easy for me to pick H-dek here. I got to keep Byeong-Hun An from last year with my 17th round pick, which seems to be a pretty good deal for someone who’s going to be playing in the majors and WGCs. Also shoutout to Sara for making my last four picks while I was knocked out getting my temporal surgery done last week (I gave her a list to go off of). Max Homa is a good pick, but besides him… yeesh. I literally have no idea who Joel Dahmen is, so gotta be a big fan of his from now on. Very excited about Dahmen. Most excited about (my team): Joel Dahmen, for obvious reasons. Best value pick (my team): Dahmen, Joel. Late rounds = great rounds, baby. Biggest Regret (my team): J. Dahmen. I should have taken him far earlier. Best pick (any team): The Dahmster, hard to beat this pick regardless of round. Worst pick (any team): Joel Dahmen. I know way less about golf and am way worse at golf than the other members of the league. I make up for this knowledge handicap by having irrational confidence in certain players. Even though I got 5th last year I went with a strategy of loading up on players I had last year. Question: If you have a high opinion of a player and he underperforms your expectations in one year then does that mean that, based on the law of averages, said player has to overperform in the following year? Answer: ABSOLUTELY! Of my 25 players, 8 of them were on my team last year and drafted based on that completely logical reasoning. On the very low likelihood that sound logic doesn’t turn out in my favor I have a guaranteed 5+ Tiger(!!!) victories this year as a nice fall-back. Player on my team I’m excited about: Tiger!! 4th round– I almost took him a round before I actually pulled the trigger on him. I had to have him. I’m already fully in the tank on cheering for his success this year and to not have had him on my team would have been tragic. I have no idea if the value is correct where I got him but I’d rather lose this league with Tiger than win it without him. Best value: Robert Streb 22nd round– I drafted Streb in the 6th round last year and he woefully underperformed for me. However, given that he made $4M two years ago I feel great about the potential value to be offered as a 22nd round draft pick if Mr Vertical Follow-Through can find get any closer to that 2015 form. Pick I liked least/regret: Chris Kirk 6th round– By the time we got to round 6 I had run out of top guys I was excited about and wasn’t yet ready to jump into my sleeper/breakout guys. I did a little research and felt like Chris Kirk might be decent value. However, he bores me and I immediately regretted this pick. The only thing I could find interesting about this guy (who I don’t believe even has an Instagram account – c’mon man!) is that he was somehow listed by Golfweek as one of their best dressed golfers of 2016 for this meh look at the Dean & Deluca Invitational last year. Worst pick on any team: JJ Spaun 10th Round by Jack – He was the first guy drafted who I had not previously heard so when he was drafted I looked up his pgatour player card and, other than bearing a striking resemblance to actor Michael Pena, I couldn’t find any information to make me think he will be good this year. Holy Trap! How off base was that quote?!?! – I managed to draft a lot of guys who didn’t play much in the states, specifically picking three guys who didn’t make a single dollar. Further I had the worst pick in 8 of the 25 rounds, and had the second worst pick of the first round going with Speith. That’s some hot stuff right there. So my motto for 2017 is that I can only go up from here. I continued to try and pick folks I like to watch and hence have some retreads from last season (Speith, Dufner, Aphibarnrat). My other thought was to target players who made big jumps in the world rankings over the course of last season (Stricker, O’Hair, Kokrak, Dufner). Even though Speith wasn’t much of a #1 last year, he is still one of the best and worth the 4th pick in the draft. Took some early risk with Stenson and Grace, as they play a modified tour schedule, but I couldn’t pass up on Hank in the second round and I think Grace is eventually going to win a major (this year would be a big help for me). I don’t know a lot about a number of cats I took in the later rounds so I am excited to learn about some “new” players…players actually playing in PGA tour events. A) Player on your team most excited about: Jason Dufner – I like watching him play golf. B) Pick on your team with most value: Lee Westwood – Normally not one of my favorites, but I think this is a rebound season for him and he’ll contend in a major or two. If he wins $2m in earnings, I would be overjoyed. C) Pick on team we like least/regret: Colt Knost – he is physically tough to look at. D) Best Pick on any team: I loved Grant’s early move on Brooks Koepka. He is one of my favorites. E) Single Worst Pick on any team: Rory McIlroy – wish he’d just give up the game already. Draft Recap: As the reigning league champion (*waving hands like I just won an Olympic gold*), I was awarded the 5 pick for the draft. Initially I thought I’d be screwed into having to choose between an oft-injured Jason Day, a hit-or-miss Jordan Spieth, or an un-root-forable Patrick Reed. Luckily Rory fell into my lap, so there’s a guaranteed $10 million. From there I tried to be pretty stock as far as proven players. Disappointed that Bubba fell to the end of the 3rd round so I had to take him with a frown on the outside. Other than Rory, Russell Knox was my favorite value-wise pick in the first 10 rounds. On the other hand, Paul Casey was a bit of a stretch early in the second round, but his recent form and the number of events he plays in leads me to think he’s prime for a win or two. In the later rounds, Alex Noren and Thorbjorn Olesen are going to dominate WGC’s and Majors, while C.T. Pan and Curtis Luck (am) are going to let me down like elevators. Thorbjorn is team Captain. Most excited about: Thorbjorn Olesen. Thunderbear. My dude. Came on strong after some injuries in the past few seasons with a win in Turkey and looked exceptional at the World Cup of Golf last month. Best value: Alex Noren. Ranked 9th in the in the world at the time of the draft, the Swede had four wins on the European tour last season. He dropped to the 13th round, likely due to a limited U.S. tour schedule, but c’mon… 9th in the world in the 13th round. Biggest Regret: Curtis Luck. I waffled on the 25th round pick and was disappointed with my selection immediately. I really wanted to take Jordan L. Smith, who just took 3rd in South Africa in a Euro Tour event. Didn’t trust my gut and regret it. Also Luck is an amateur and is likely to remain so until after the U.S. Open. Hoping he gets enough sponsor’s exemptions after turning pro to make some money. Best pick on any team: Lee Westwood. The guy can flat out roll the rock. In fact he rolls the rock far more often than he should. Worst pick on any team: Richard Sterne. Zach… I’m sorry. First off, I missed out on Rory. I chose to pick in the 6th spot over 5th thinking that McIlroy was a lock in the top-4 and would be gone. However, I’m not complaining about ended up with Justin Thomas and Patrick Reed. I think there is major success this year. Moving on, I really like my squad’s selection from round 13 on. I honestly was disappointed the draft ended when it did as I had a few more guys ready to go waiting to be selected. I love the mix of PGA Tour veterans who cash checks like Harman, Herman, Molder, and Jacobson. I love the mix of risky young guys like Barber, Wyatt, and Stone. Brandon Stone is a multiple European Tour winner, top 100 in the world and picking up a few starts in 2017 on the PGA Tour. I love the mix of Europeans who are planning on playing more in US in 2017 like Lowry and Kjeldsen. Oh yeah, I love one of my keepers, Si Woo Kim. There wasn’t a better value pick than him in the entire draft. A: player on my team most excited about: Justin Thomas slightly over Soren Kjeldsen. JT already has two wins on the season and is poised for more. Kjeldsen plans to play a lot in US this year so I like his prospects. B: best value on my team: Freddie Jacobson in round 23 was a steal. C: least favorite pick on my team: Ian Poulter is round 12 was a bit of a reach as he is on medical extension but one good start sets him up for the year. D: best pick overall: Rory McIlroy falling into your lap at the 5th spot overall is definitely up there but that was too easy so I’ll give credit elsewhere. Francesco Molinari in the 12th round is pretty good. A guy that gets his PGA Tour starts and is top 35 in the world in the mid rounds is going to be fruitful. E: worst pick overall: Other than choosing to pick 6th overall and thus missing out on Rory in the draft, my worst selection is probably going to be Richard Sterne in the 11th round by Zach. It was such a shock, that don’t even know why it was bad other than it wasn’t good. First off, sorry for the click-baity title there, but how else was I supposed to describe a list of golf courses? With that apology out of the way, I won’t waste time introducing this post since I’m sure people never read anything other than the titles in list posts. Also, this article isn’t meant to be full reviews of the courses, that would take up too much space. Rather, this represents a quick hit on some of the notable courses I got to play this past year. They aren’t ranked against each other, but instead listed in the time order I played them. First up, Alabama. This past end of January 2016, so coming up on a year ago now, I had a week off and went to play some solo golf down in Alabama on the Robert Trent Jones Golf Trail. And if you didn’t see some of my comments from back then, I highly highly recommend the trail. None of the courses I played were below average, and what was great also was that it was the “offseason” which meant that it was cold enough to keep the locals away, but warm enough for me and my resistance to cold weather when golfing. Of all the courses, I’ll highlight Ross Bridge. Mostly because it tips out at 8,191 yards, with a rating / slope of 78.5/135. It was also great because I was literally, and I mean literally in the literal sense, the only person to play the course that day. Back to January at the Robert Trent Jones Golf Trail. Cloudy but warm day at Ross Bridge. The overseeded greens were perfect, and I was the only player on the course that day. Literally nobody else. 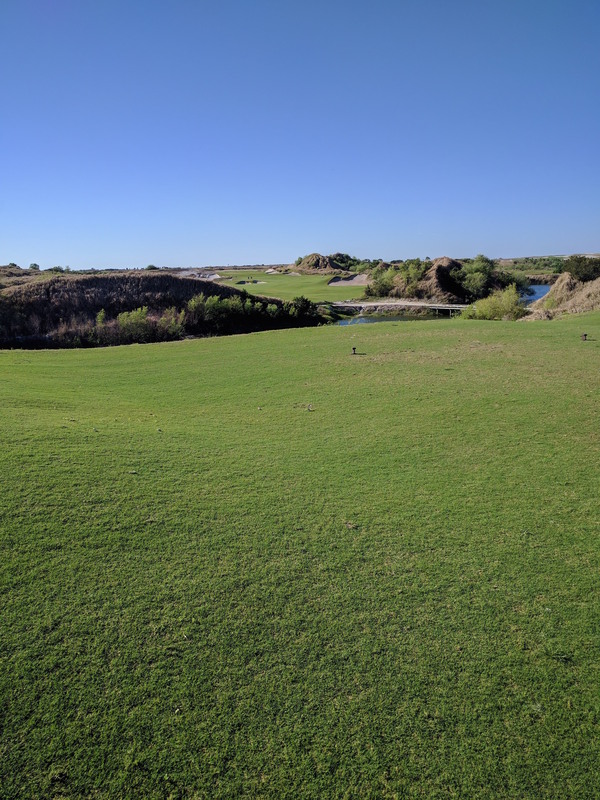 I also played the course at over 8200 yards. And had a blast doing it. Seriously, go to the RTJGT. The cloudy sky, and lack of overseeded rough also made for some cool pictures. The one thing that happens with an 8,000 yard course is there’s very little variation in the lengths of the holes. The par threes were all about 225 yards, and likewise on up with the par 4s and par 5s. I can’t imagine having a course that long with a drivable par 4 or something, though I think Erin Hills can claim that honor, which is over 8k and has a drivable par 4 on the second hole. A few notes on the other courses I played on the trail: The ones at Capitol Hill were awesome, only issues were that it was in the 30s to start (cold to even me), and also that the cart ran out of juice on my second 18 of the day around the 13th hole. Oxmoor Valley was also baller, with the Ridge course being on a ridge. Scroll through those pictures on the link and check out that elevation. It was great. Also great that I got 54 holes in that day with only having to play through 2 groups. Now that’s the best. If I only played 13 of the holes at a course, does it still count as playing a full round? Definitely not handicapwise, but in terms of this post, it sure as hell does. The newest of the Coore Crenshaw production courses only had the front 9 officially open when we played in July, with 10, 16, 17, and 18 open for play, but without tee markers, which made finding the tees on number 16 very difficult. The course was so new when we also played it that they were in the process of digging out grass that had grown its way into the newly sanded bunkers. The expression on the face of this high school aged dude who was doing the digging showed that he really really didn’t want to be there. But hey! That’s what summer jobs are supposed to be right? It’s very hard to describe this type of dry, links golf when most people are used to the tree lined country club style courses with lush rough and round greens. Coore Crenshaw do use some of the “template” holes that you’ll see on those old school courses (like the punch bowl 17th, or the redan 3rd), but a lot of their green designs are novel. I think my favorite example of this is demonstrated in the second hole, with a wide fairway to the left, and an offset green to the right. Challenging the right side leads to an easier approach shot, both visually and slopewise, but there’s also a pack of trees to that side which can screw you if you veer too close. 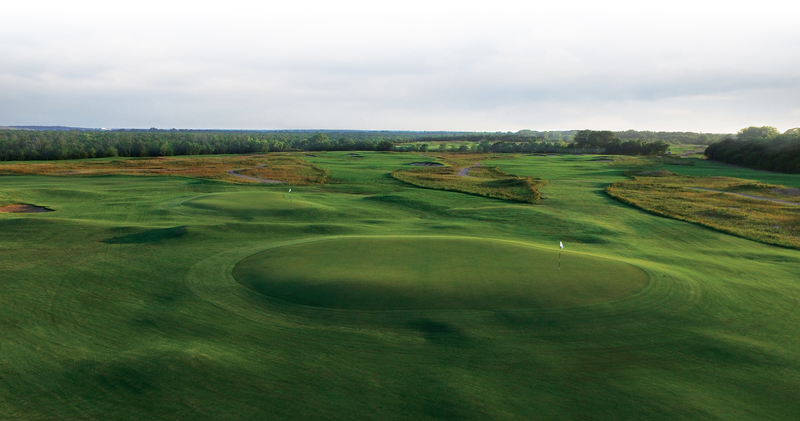 The new Coore Crenshaw courses also feature the hip runoff areas without rough that are becoming more and more popular. Think the Olympic course by Gil Hanse, or any of the British Open rotation courses. Rough is out, runoff areas are in. Made it out to @sandvalleygolf recently, really cool to get a preview of the course. Played the front 9 twice, and then the 4 open holes on the back. This is the view from the 9th tee, downhill shortish par 4. Some options off the tee, but I ended up hitting driver down in the front right bunker the first time, and 3 wood to 60 yards the second time around. Excited for the rest of the course to open next year. I was also a fan of the elevation change on the property out there. A lot of design has to do with the piece of property you’re given, and unless you pull a Pete Dye at Sawgrass where he made a course out of swamp, it’s hard to get that super highly ranked course design unless you have some elevation.